LeafGuard by Midlands Home Solutions are your local experts for complete roof replacement. We service a wide variety of roofing materials and give you a durable, high-quality roof that will perfectly complement your home and last for years to come. Let us help you give your home a beautiful new roof that will keep you safe and dry. 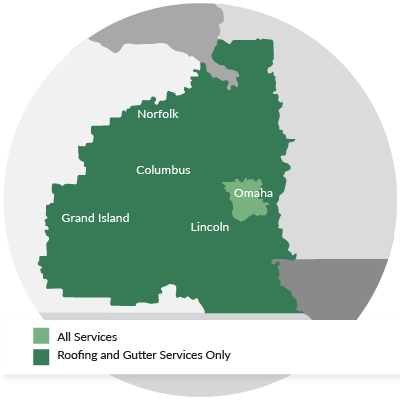 Call us today at 1-844-807-6136 or click below for a free estimate on total roof replacement or any of our roofing services offered in Lincoln, Omaha, Council Bluffs, and nearby! Before & after pictures in Malvern, IA. We installed white LeafGuard Gutters and Hickory -Timberline Lifetime Ultra HD asphalt shingles. These homeowners stopped at our booth at a local home show and showed interest in wanting to get a new roof installed on their home. After meeting with the homeowners, they determined to have a new GAF roofing system installed on their home. To begin this project, we removed the existing roofing components on the home, which included two layers of existing asphalt shingles; down to the existing decking. This homeowner in Omaha, NE received hail damge to their roof. These pictures shows the roof before and after the Hickory Timberline HD GAF Asphalt Shingles. We also replaced the homeowners wind turbines with GAF Snow County Ridge Vent. These homeowners contacted us because they experienced some storm damage to their roof. They needed to have a complete roof replacement, which we worked with the homeowner and insurance company on. Due to storm damage, these homeowner’s roof was damaged out by their insurance company. So, they gave us a call and we worked with them and insurance company to replace their roof. After stopping at our booth at a local county fair and meeting with us, these homeowners decided to have us completely replace their existing roof. The roof was one of the two major projects that the homeowners wanted to complete on the exterior of their home. Due to a storm that went through the area, these homeowners needed to have a new roof installed on their home. After working with the homeowners and insurance company we did a complete roof replacement on their home. Before and after pictures in Beatrice, NE. 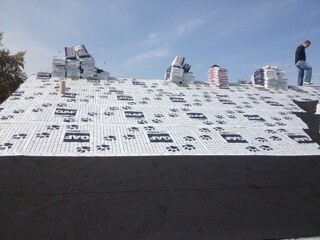 We installed a Impact Resistant GAF-Armor Sheild Roof. In North Bend, NE we installed Shakewood GAF Armor Shield II asphalt shingles. GAF Armor Shield II's are an impact resistant - architectural asphalt shingle. Call LeafGuard by Midlands Home Solutions today if your roof is displaying these signs. Our expert roof inspection can tell you if you need a full replacement or if repair and maintenance is a better option for your home. If you think it might be time to have your roof replaced, contact LeafGuard by Midlands Home Solutions today to have your roof inspected by one of our experts. We proudly serve in Bellevue, Sioux City, Kearney, Grand Island, Hastings, La Vista, Fremont, Gilead, Martel, Columbus, Elkhorn, Roca, Bennington, Davey, and throughout the surrounding areas.